Designer Brendan Dawes shared his design expertise with students as a visiting Rankin Scholar in Residence in the Westphal College. Imagine this: you walk into your closet in the morning and a device on the wall notifies you that the weather is a bit blustery outside. So you put back the T-shirt you were planning to wear, grab a sweater instead and you’re out the door! UK-based designer Brendan Dawes created an electronic device that does just that. Dawes’ playful, innovative work is internationally recognized and explores the interaction between objects, people, technology and art, using an eclectic mix of digital and analog materials. Through his websites, iPhone apps, software, books and other creations, he introduces new objects that disrupt the status quo. Among his numerous projects, Dawes is the creator of Kennedy, an iPhone app that marks moments in time by capturing surrounding context such as location, date and time, current weather conditions and more; The Happiness Machine, a small Internet-connected printer that delivers random happy feelings from people across the web and which was featured at the London Design Festival; the Doodlebuzz news interface featured at MoMA; Six Monkeys, a project looking at email as tangible objects which was recently honored in the Fast Company design awards; Cinema Redux™, which was acquired by MoMA for its permanent collection, and many others. 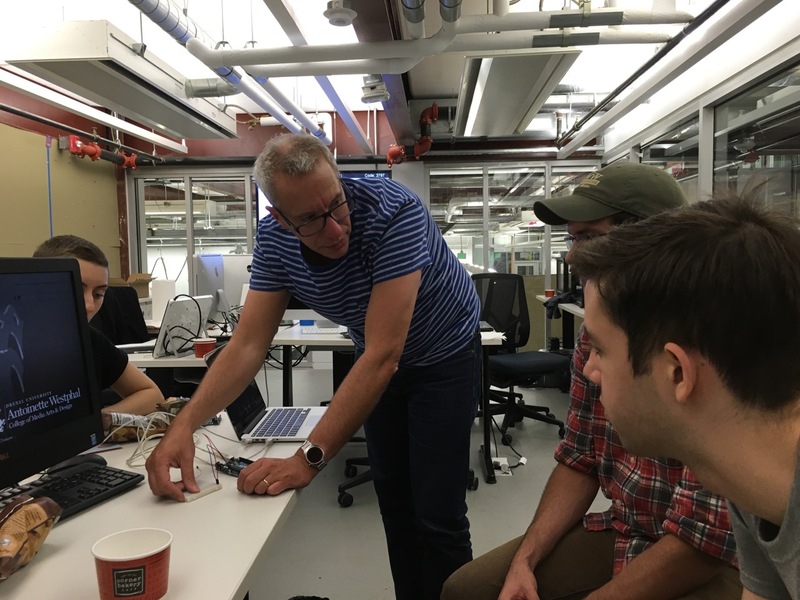 Dawes joined Drexel this week to share his design expertise with students as a visiting Rankin Scholar in Residence in the Westphal College of Media Arts & Design. 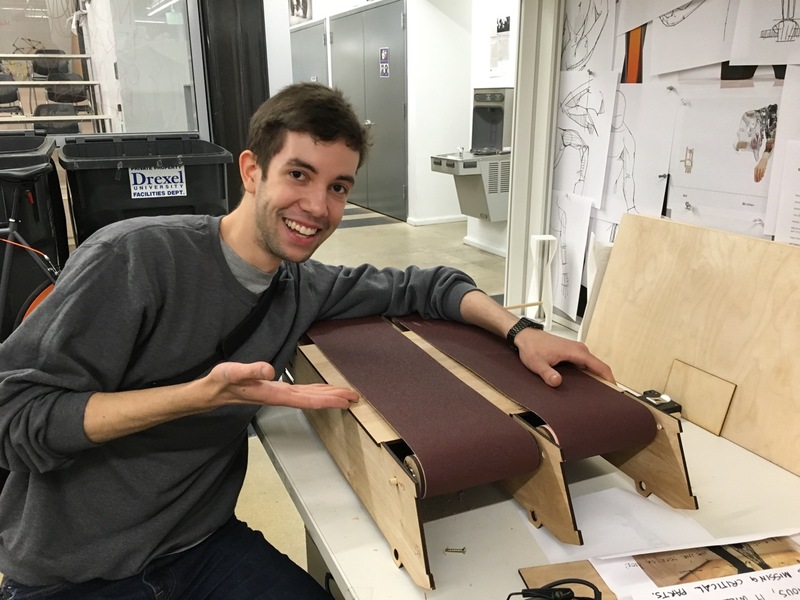 Senior product design student Arvid Roach assembles the race track that will be driven with DC motors connected to an arduino board for the “Dog vs. Cats: A Race for Love” project. Through a series of workshops, Dawes led participants in creating interactive art that blends technology, design and social media. The workshops were open to any student interested in learning about interactive design and art, arduino (programmable computer boards), coding and creative collaboration. The goal of the experiment was to create discourse and highlight the absurdity of the things people publicly share. The resulting projects will be presented on Friday, Oct. 9 at 6 p.m. in the URBN Annex Screening Room (3401 Filbert St). The event is free and open to the public. The 18 participating students, with majors ranging from product design and digital media to graphic design and computer science, formed three teams and created projects that use live streams from Instagram and Twitter in a tangible, interactive way. One team created a device that allows people to see their weight measured in Instagram pictures of food such as pizza and doughnuts. The second team made a device that races a cat and a dog based on the “favorites” of cats and dogs on Twitter. The final team designed a radio that tunes into large corporations on Twitter when they tweet apologies to customer complaints. 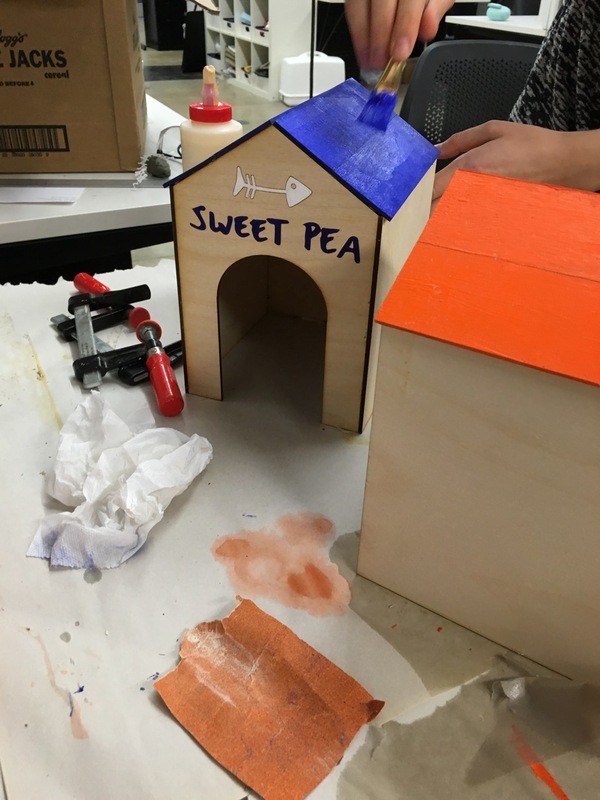 Junior product design student Gina Lerman paints houses that 3D printed cats and dogs will come out of and race down the track in the “Dog vs. Cats: A Race for Love” project. Members of the news media who are interested in speaking with Glaser should contact Alex McKechnie at ahm62@drexel.edu or 215-895-2705.